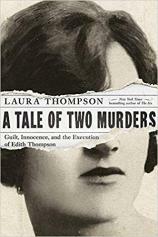 A TALE OF TWO MURDERS is an engrossing examination of the Ilford murder, which became a legal cause ce´le`bre in the 1920s, and led to the hanging of Edith Thompson and her lover, Freddy Bywaters. On the night of October 3, 1922, as Edith and her husband, Percy, were walking home from the theatre, a man sprang out of the darkness and stabbed Percy to death. The assailant was none other than Bywaters. When the police discovered his relationship with Edith, she --- who had denied knowledge of the attack --- was arrested as his accomplice. Her passionate love letters to Bywaters, read out at the ensuing trial, sealed her fate, even though Bywaters insisted Edith had no part in planning the murder. They were both hanged. Freddy was demonstrably guilty; but was Edith truly so? In shattering detail and with masterful emotional insight, Laura Thompson charts the course of a liaison with thrice-fatal consequences, and investigates what a troubling case tells us about perceptions of women, innocence and guilt.